It’s a question that we all became familiar with at some point or another, and it opens the door for more questions. We’ll answer your concerns about distinguishing between the two types of guitars, and which one is best to start off with. Which is Easier to Learn With? We all know what a guitar is, and for the sake of getting straight to the point, we’re simply going to say that an acoustic guitar is one that doesn’t require amplification to be heard. It uses its own hollow-body construction to project sound generated from the vibrations of the strings in relation with other factors such as tonewoods and all elements put into guitar making. This encompasses a variety of guitar types such as bass, flamenco, and steel guitars. However, in general, most people automatically think of steel string guitars when they refer to acoustic guitars – we’re guilty of doing that too. In fact, for this guide, we’re specifically referring to steel string when we mention acoustic guitars. 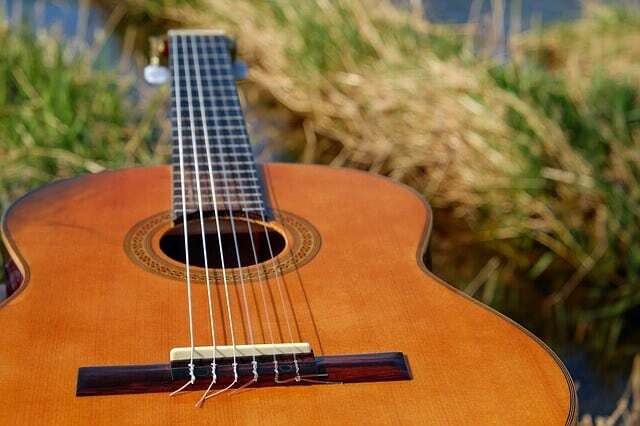 Despite the generalized and interchangeable use of the steel string and acoustic terms, classical guitars do fall under the acoustic category. Here we have a nylon string guitar in the acoustic family that provides a different look, sound, and comfort level. Acoustic guitars come in many shapes and sizes, and to make it even more interesting, many combinations of tonewoods, hardware quality, and string quality can also affect how you feel about that guitar. While the pros and cons can be more detailed for a specific guitar, we’re going to keep it general. Being able to spot the type of guitar you want can be easily done if you know what to look for. If you’re shopping in-store, you’ll immediately be able to see the distinguishing, tell-tale features. However, shopping for an acoustic guitar online can be trickier if picture quality isn’t the best or if the product description is lacking specifications and details. We’ll give you a few tips on how to tell them apart! The obvious difference that you’d be able to visually see is the shape and size. While steel string acoustics can come in various body shapes, sizes, and with cutaways, it often comes with the dreadnought shape. It’s full size and loud and proud of it. The classical guitar is going to be much smaller in size. Parlor and some concert acoustic guitars are often similar in size to classical guitars. Classical guitars have wider necks and fretboards than steel string acoustics. The strings may be a little wider-placed, and because of the size and shorter scale length, it can be easier to play than an acoustic. These days, many acoustic guitars come with the neck joining the body at the 14th fret. However, when the neck joins the body at the 12th fret, it’s a time-honored and classic feature of many an acoustic guitar, but especially that of a classical guitar. This mightn’t be obvious to you until we point it out, but acoustic guitars usually have all the fixings when it comes to hardware. The neck sports dot inlays, higher frets, and a full scale. They also sport pickguards, and most of the time, bridge pins. On the opposite end, classical guitars don’t have pickguards or dot inlays to mark the frets. The classical guitar may also lack bridge pins. The headstock may also have cutouts, and they typically lack machine heads and pegs for steel bars instead. It wouldn’t matter if tonewoods and size were the exact same between a classical and an acoustic guitar, the acoustic will always come out louder and stronger thanks to the steel strings. The classical is on the short end of the stick due to its size and nylon strings, but it does have its benefits. It’s easier on the fingertips since the strings are nylon, and its size offers more comfort to play sitting down while having easy access to the entire fretboard. It’s a guitar that’s typically played for Spanish-style, classical genre, and classical playing techniques, solos, and finger picking. Acoustic steel string guitars are always going to be louder, more vibrant, and stronger in sound. They’re pretty good for playing with most music genres from folk and country to some rock and jazz. They’re often used for strumming and accompanying vocals. You can also use a pick or fingerpick with an acoustic. They’re versatile and practical instruments. The debate between which acoustic guitar is best for you isn’t necessarily about pitting an acoustic against a classical guitar, or any other guitar. What it really comes down to is nylon strings versus steel strings. Other than the obvious sound and projection differences that’s generated from string vibration, you also must consider other integral elements that tie-in with the type of string your guitar has, primarily the truss rod. A truss rod is a steel rod built into the neck of an acoustic guitar. This allows you to adjust tension and action of the strings. In an acoustic guitar, steel strings are held with so much tension from the headstock to the bridge pins that they need a truss rod to prevent a neck from bending/bowing. By adjusting the truss rod, you can keep the strings taut without potential risk to bowing the neck and keeping it straight for many years to come. Do not put steel strings on a classical guitar! Without a truss rod and bridge pins to support the higher tension of steel strings, you risk damage to the neck. But, can you put nylon strings on a steel string acoustic? It can be done, but for the best sound, it shouldn’t. A steel string acoustic is made for higher tension provided with steel strings. With a heavier bracing under the soundboard, all elements of the guitar would be maximized to its fullest potential with steel strings versus nylon. Which is Easiest to Learn With: Acoustic or Classical? You’d expect the clear-cut answer to this to be the classical guitar. It seems to be the obvious choice. It’s smaller, has nylon strings, and it’s easier on your fingertips. They can be quite a bit cheaper than an acoustic guitar if quality and tonewoods are the same side to side. However, acoustic guitars can come in parlor, concert, 3/4 size if a full-size dreadnought is too big. Even the body shape can have a cutaway to provide access to the entire fretboard and be comfortable to sit and play with. Necks can be tapered and slim. Steel strings also come in various gauges to make them easier on the fingers and to play. There’s no clear-cut answer on which one is best to learn with. The one that’s going to be the easiest to learn on is the one that encourages you to pick it up and play it, and then to keep going. It must be a guitar that you like, respect, and appeals to your preferences. If this causes an internal debate on which guitar is best for you, we’ll address that next. You don’t have to go without or compromise to get the perfect guitar to learn on, grow with, or keep for a lifetime. Which Guitar is Best for You? It really comes down to what you want and what you’re looking for. So, we’ll try to cover a few, possible scenarios that may work for you to help you decide. Young child/smaller adult, small hands, budget-restricted. Although classical guitars have wider necks and fretboards, you can also look for a classical student guitar that would be great for a beginner. The neck should be slightly slimmer and easier to play. They can also run in the low budget range of around $100. A classical guitar should be your instrument of choice. The nylon strings will be nicer on your fingertips as a beginner, and when it comes to classical and even Spanish-style tastes, the classical git is the expert. Adult, beginner, want to sing along while playing, casual playing. The acoustic is going to be the way to go. It’s a great guitar for picking up and playing on the go, the couch, or performances for family and friends. They’re versatile instruments for playing with multiple types of music genres that pairs excellently with vocals. Beginner acoustic guitars don’t have to cost a lot as they can be as low as under $100. Travel a lot, play with a band, sing while playing. While a classical guitar might seem like it would fit the bill because of its size, an acoustic will be more appropriate. It’s true that most steel string guitars may be full-size dreadnoughts, but there are also travel guitars that come in various sizes: 3/4, travel, mini, parlor, and concert. With steel strings, you’ll still have the sound projection you need, and with quality tonewood choices, you’ll ring out with true acoustic authenticity. Fingerpick and strum, sing along while playing. It doesn’t matter if you’re an adult or young player, an acoustic fits the bill here. It’s a versatile instrument that can come in various shapes and sizes to suit the player’s height and build. The toughest choice you’ll have to decide is how much you want to spend. Fingerpick, live solo performances, advanced player. If you’re a quick learner, but you’ve been hitting the steel string gits for a long time, you’re going to have a run for your money with the classical guitar, because that’s what you need to get. Because of the wider neck and fretboard, you’ll have to be meticulous with your technique. A classical guitar can help you refine your talent and express it with finesse. We think you get it by now. You’ll have to think about what your intentions are with the guitar, and what your personal playing style is. If you’re a timeless classic, then a classical guitar is perfect. If you’re sort of trying to find out what your style is, and you want to explore it all, an acoustic will see you through. Each guitar has their own style and personality to offer in the music industry. But, in the end, there are no hard and fast rules. You can do whatever you want, on whatever guitar you want to create your own music magic. In fact, many noted musicians have done just that and put their guitar on the map. If you’re serious about making music a passion in your life, you’re bound to try out, strum, and pick through a lot of them. It’s not about choosing between them, it’s about experiencing all of them. It’s what separates you from just the guitar players to the artists and musicians of your day!